List the ways you can deploy your free trial. Explain how to create a Signup Request. Describe the benefits of hosted trials. Put the free trial on AppExchange, where prospects can download it directly. Provide trials to prospects at their request. Set up a customized web form to provide hosted trials on demand. The AppExchange option is the easiest approach. The other two allow you to interact with your prospects. Let’s start with the easiest. As we said, this is the easiest option, but it’s also the most limited. For instance, you can make available only one Trialforce template at a time. Also, you miss out on Signup Request, a really cool feature for capturing more information about your leads. More on this in a minute. But if you have only one template and you just want to get your trial out there, this method can do the trick. 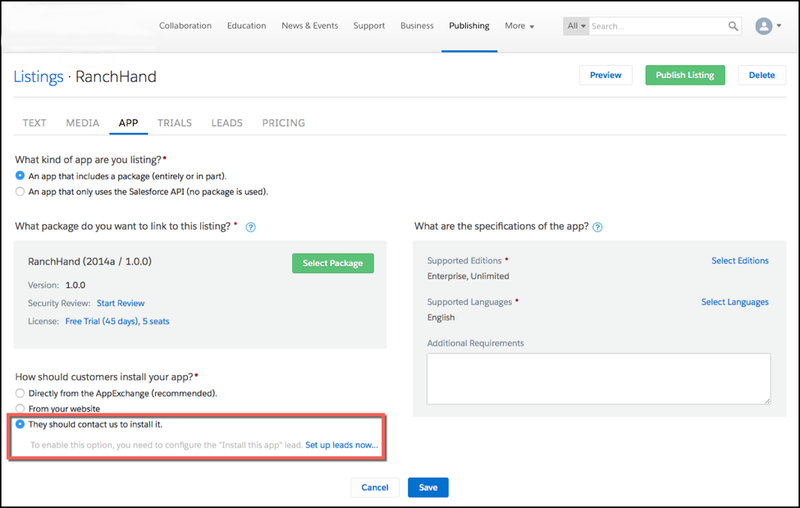 You make your trial available by enabling Trialforce from your AppExchange listing. 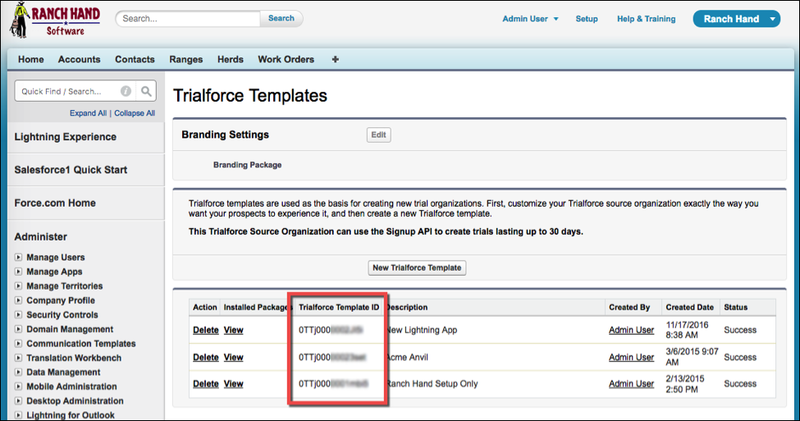 To do that, link your Trialforce template to your AppExchange listing. On the Publishing Console, click Listings. Find your listing and click it. On the Trials tab, select Offer a free trial organization and click Change Template. Follow the on-screen prompts to add a trial template to the listing. Now when customers visit your listing, they have the option of installing your app in a free trial. We collect contact information for prospects who start trials on AppExchange. We ask them to agree to your terms and conditions, as well as our Master Subscription Agreement. Each prospect who provides this information receives an email with a link to a trial org. If you set up email branding using a Trialforce Management Org, the email comes from you. As we’ve mentioned, a Trialforce trial org is a fully functioning Salesforce organization. Prospects can use your app and can install additional apps as they see fit for the duration of the trial period. The other two approaches require you to get information from your prospects before delivering a trial. This information is collected by a Signup Request. If you have more than one template, or if you want prospects to give you more information before you give them a trial, a Signup Request helps you ship them customized trials. A Signup Request is a custom object used to generate trials using Trialforce templates. Each Signup Request holds basic information about a prospect and the associated template. New Partner Business orgs come with the Signup Request feature installed. If your Partner Business org doesn’t have it, you can ask for it by opening a support case. You can create a Signup Request object manually by entering a new record, or automatically via the Signup Request API. We show you both methods. A Signup Request object contains the essential information about your prospect: their name, company, email, and trial username. It also identifies the Trialforce template to use for their trial. Each Signup Request also has a history containing information about a trial’s status and provisioning. Sometimes you want to interact with prospects before giving them a trial, to qualify them, to verify their contact information, or to interview them about their needs. Click App, and under “How should customers install your app,” select They should contact us to install it. Prospects see a link to the free trial on your AppExchange listing. When they click it, they see a prompt to provide their contact information, which you then receive in an email. You can contact them to discuss their needs or verify their information. Then you create a trial for them by adding a Signup Request record. Select the prospect’s company, or if you don’t see it listed, type in the name. Fill in the prospect’s first and last names. Choose a username that is unique within Salesforce, since it’s hard to know whether the prospect’s email address is already used in another org. Like all Salesforce usernames, it must be in a valid email format. For example, if your prospect’s name is Pat Jones and your company name is AcmeApps, use something likePat_Jones@AcmeApps.Demo.Org. If you choose a name that exists elsewhere in Salesforce, you see an error in the Signup Request history. Select a template for your trial. Every template you create has a unique ID. You can find the IDs for your templates in your Trialforce Source Org (TSO). In a separate browser window or tab, log in to your TSO. From Setup, type Trialforce into the Quick Find box and then select Trialforce Templates. Now copy and paste the ID for the template you want to use into the Template field in the Signup Request dialog box in your other window. If you need to do anything special to configure a Trialforce org before your prospect sees it, select Suppress signup email. This prevents Trialforce from automatically sending an email, and it lets you contact your prospect when things are set up. Because it gives you so much control, this approach is a great way to create demo orgs for internal users. You can also use it as part of an outbound sale, offering an unsolicited trial to a prospect. Responding to every request for a free trial gives you a lot of control, but it also requires a lot of your time. Use caution with this approach if you have a lot of clients, and make sure you follow up on their requests quickly. Log in to Salesforce Partner Community. On the Publishing page, click Listings. Click App, and under “How should customers install your app,” select From Your Website. Provide a URL for your website. Then you provide a web form on your own site. 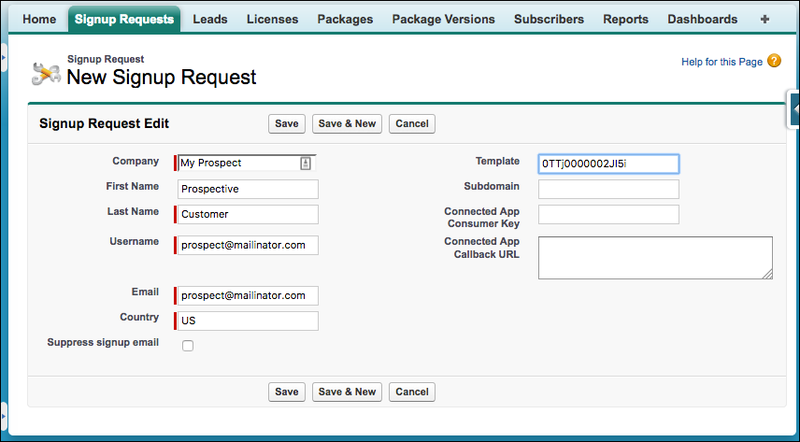 When prospects fill out this form to request a free trial, that request generates a Signup Request record using an API call. This record creates a trial for that prospect. To create the web form, you can use a traditional HTML form: You can make a picklist that displays user-friendly template names corresponding to template IDs. This lets your prospects select their own experience. 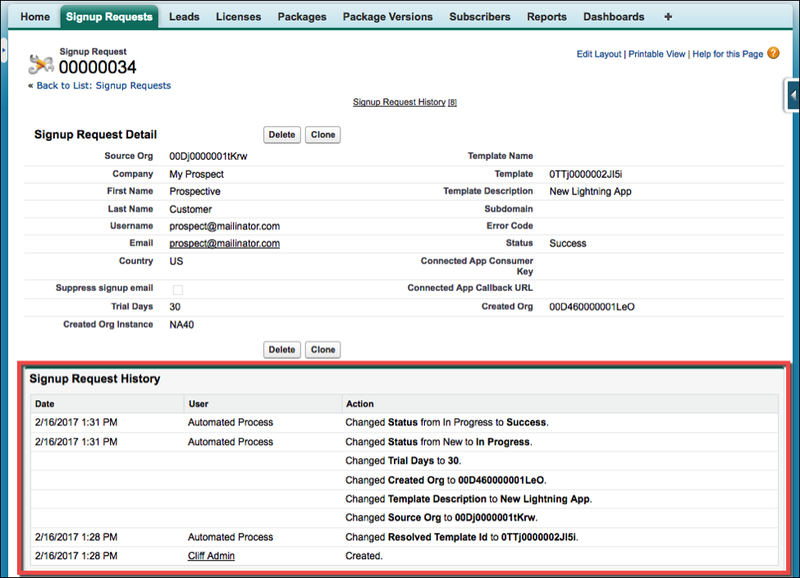 When you build your form, include a link to the Salesforce Master Subscription Agreement and a checkbox for prospects to accept its terms. You can also add custom fields to your form to collect more information, but keep it simple—you want your prospects to make it to the end, after all! Your web form must have the same fields as your Signup Request object, so make sure they match. If you have questions about setting up hosted trials on demand, have a look at the ISVForce guide. It describes exactly how to do it. Trialforce: A full-blown framework for creating immersive experiences tailored to your customers. Sales teams love it! What you get out of your trial depends on what you put into it. The more you plan how to present your product in a free trial, the more customers you are likely to get from that trial. And we provide the tools you need to execute your plan. Let’s show everyone why they need what you’re offering!